This technique might work with low error in lots of cases, but not all… it is flawed. Above is a plot of the expected MLL calculated as RL/2 for s/c and o/c terminations using a directional power meter calibrated at 50+j0Ω (ie zero calibration error), Witt’s calculation (Witt 2005) and the actual loss for Belden 8259 (RG58A/U) at 1MHz. 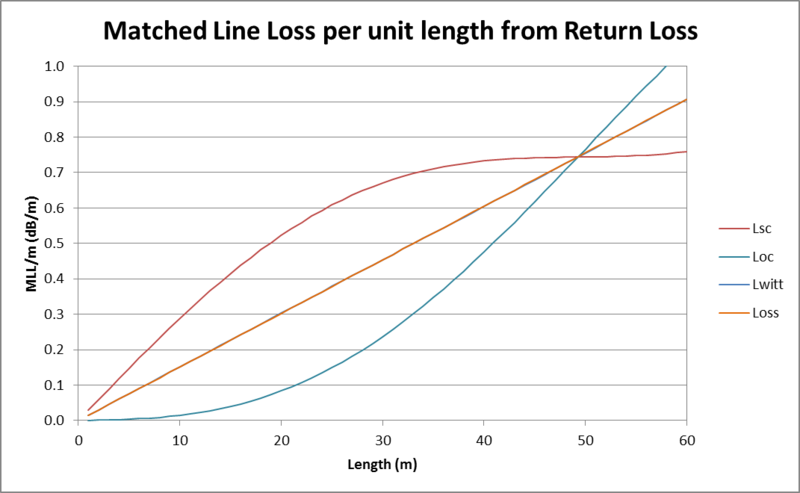 The first thing to note is that there is a large difference between Lsc and Loc at some cable lengths, and a large error (the difference to the Loss line). The error is from -96% to 80% over the range of this plot, and that sort of error might well lead to discarding as faulty some perfectly good line. 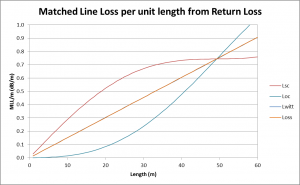 Witt’s calculation is very close to the actual Loss line, and the error is so small as to be insignificant in the scheme of things… but Witt’s calculation is an approximation, though a good one for most purposes when the assumed Zo is very close to the actual Zo and loss is low. If the instrument is calibrated for an impedance other than 50+j0Ω, the response is different. Whilst Witt’s calculation does almost cancel out error due to the cable impedance being a little different to nominal, it does not fully compensate for error in the instrument calibration impedance. The plot above is of the 10MHz scenario discussed by (Witt 2005). The model is very slightly different to Witt’s (a result of different derivation of primary line parameters from published data), but it shows the effect of measurements at different line lengths. The difference between Witt’s calculation is insignificant in practice in this case. The problem is that the instrument calibration impedance is not exactly that of the coax, and this error is greater for lossier cables at lower frequencies. As you increase frequency, actual Zo approaches nominal Zo (manufacturing tolerances aside). 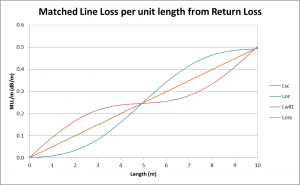 The key indicator is if evaluation of half return loss using a s/c termination is significantly different to using an o/c termination, you should take the average of the two figures. Even then, the approximation is only good when the assumed Zo is very close to the actual Zo and loss is low. Bird Electronic Corporation. 2004. RF directional thruline wattmeter model 43 – instruction book. Cleveland: Bird Electronic Corporation. p14. 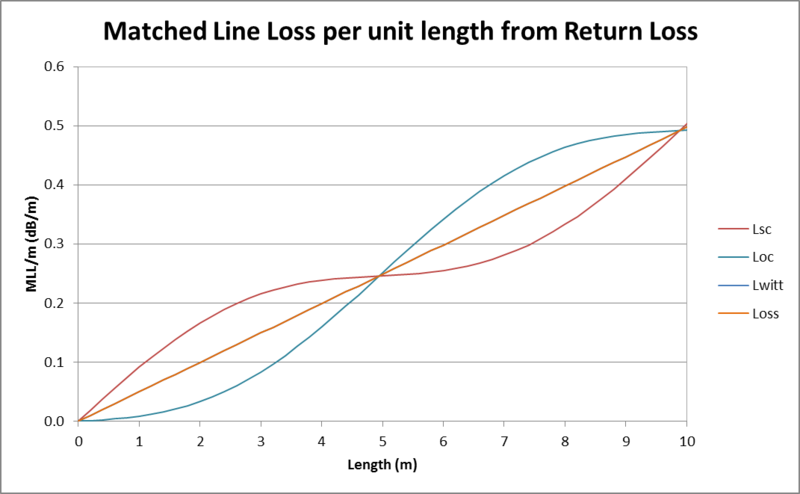 Duffy, O. Estimating Matched Line Loss from Return Loss. VK1OD.net (offline). Jennings, L. Aug 2012. Quick coax test In QST Aug 2012. Witt, F. May 2005. In QEX. http://www.arrl.org/files/file/Technology/tis/info/pdf/0505qex044.pdf (accessed 01/01/2015).